The International Monetary Fund (IMF) has said it “remains ready to support” Sri Lanka in its efforts to boost the economy and would send a team to Colombo next month to resume discussions on the stalled loan programme. IMF Managing Director Christine Lagarde met with Finance and Mass Media Minister Mangala Samaraweera and Central Bank Governor Indrajit Coomaraswamy, on January 15, in Washington D.C.
“I was pleased to meet with Minister Samaraweera and Governor Coomaraswamy this afternoon. We discussed the challenging economic environment and the policy priorities for the country. 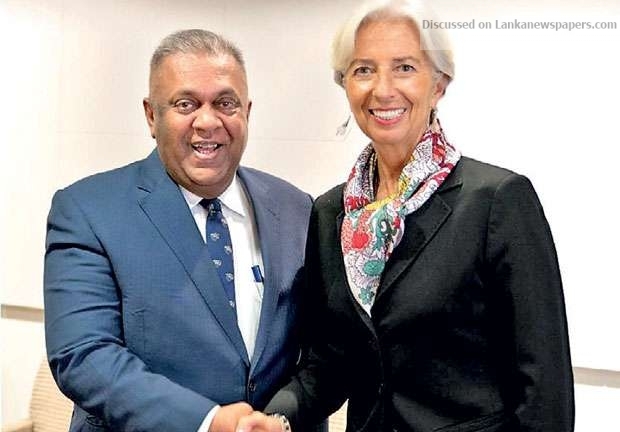 The authorities stressed Sri Lanka’s continued commitment to their economic reform agenda under the IMF-supported programme,” Lagarde said in a statement. “We agreed that a strong policy mix, with effective implementation of that agenda, is key to strengthening confidence, while putting Sri Lanka on a sustainable, high-quality growth path that would benefit its people. The IMF remains ready to support the Sri Lankan authorities in these endeavours and an IMF team is scheduled to visit Colombo in mid-February to resume programme discussions,” she added. The IMF has disbursed over US $ 1 billion out of a US $ 1.5 billion three-year Extended Fund Facility (EFF) it had agreed with Sri Lanka in 2016. The multilateral lender suspended its loan programme with Sri Lanka following the October 26 constitutional crisis. “The Sri Lankan delegation discussed the possibility of resuming the IMF programme with a view to stabilizing the economy following the disruptions of post-October 26, 2018 and stressed on Sri Lanka’s commitment to the economic reform agenda,” the statement said. ← ‘Upstart’ gets the cold shoulder!